For the second time this summer Belper Meadows Tennis Club participated in the Great British Tennis Weekend. 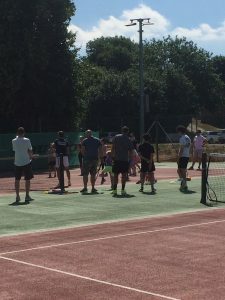 The fabulous weather attracted a good cross-section of ages who turned up to try their hand at tennis; each one supported by the clubs coach Jason. The 2-hour session which included refreshments proved to be an all-round success. There are additional opportunities to try tennis at the clubs holiday camp which is running throughout the schools 6 week summer holiday. Further information can be found on the clubs website www.belpertennis.com.